The USA stepped up pressure on Palestinian leader Yasser Arafat after the slaying of four Israeli soldiers by the radical Islamic movement Hamas, demanding that he end such attacks and deliver an “urgent” explanation for last week’s arms smuggling affair. A Palestinian child cries as he recovers a homemade toy from the rubble of his house destroyed by Israeli army tanks and bulldozers at the Rafah refugee camp in Gaza Strip on Thursday. 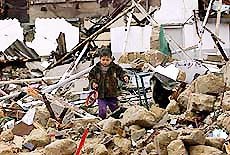 More than 45 homes were destroyed and about 100 Palestinian families made homeless in the operation. The United Nations Security Council has virtually rejected Pakistan’s request that it intervene to defuse Indo-Pak tension and asked Islamabad to crack down on terrorist groups operating in Kashmir. The tale of three Taliban ministers wanted by the USA took a confusing twist on Thursday as the Afghan official who originally said they had surrendered changed his story. The Vajpayee government has already started a strategic dialogue with the soon-to-be-installed interim government of Afghanistan, albeit informally, and the process is to get further impetus when the Afghan foreign minister-designate Abdullah Abdullah arrives here on January 12. Singer Michael Jackson is honored with Artist of the Century award at the 29th annual American Music Awards in Los Angeles Wednesday. 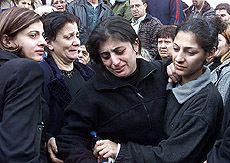 Relatives of slain Israeli soldier Hanna Abu Ghannem cry during a funeral ceremony in the northern Israeli town of Haifa on Thursday. The soldier was killed the day before in a pre-dawn raid in southern Israel as Palestinian gunmen shot dead four Israeli soldiers before being killed themselves. “A heavy burden rests on Mr Arafat to deal with these charges and to deal with the evidence as it comes forward,” Secretary of State Colin Powell said yesterday in reference to the seizure of 50 tonnes of weapons by Israel. Mr Powell spoke to Mr Arafat and Israeli Prime Minister Ariel Sharon about both incidents as he and the White House condemned the Hamas attack and insisted Mr Arafat to act against all forms of terrorism. “I encouraged the Chairman to do everything he could to look into these matters, this was a very serious matter,” Mr Powell said in an interview with Middle East Broadcasting Centre. Meanwhile, a senior US official said yesterday that the evidence presented by Israel to the USA linking top aides to Palestinian leader Yasser Arafat to an arms smuggling plot foiled last week was “compelling and extensive”. RAMALLAH (West Bank): Islamic Jihad has said it was abandoning an agreement not to mount attacks inside Israel because Israel was still attacking Palestinians. The group, saying it had previously abided by President Yasser Arafat’s call last month to halt such attacks, announced its decision after Israeli bulldozers demolished dozens of homes in the Gaza Strip. “We in the Jerusalem Brigades, (military wing of Islamic Jihad) announce that starting from today we will not adhere to the understanding with... the (Palestinian) Authority and its security services,” the group said in a statement. Asked if that meant Islamic Jihad would resume its attacks, one of the group’s senior officials in the West Bank said “not necessarily”. GAZA CITY: Twelve Israeli tanks and bulldozers stormed the Southern Gaza Strip town of Rafah and started razing homes on Thursday, less than 24 hours after members of the militant group Hamas killed four Israeli soldiers. The tanks and bulldozers had begun destroying homes under cover of heavy machine-gun fire, in Block O, a neighbourhood under Palestinian self-rule in the town on the Egyptian border, witnesses and security sources said. JERUSALEM: Israeli Prime Minister Ariel Sharon said the Palestinian Authority must bear full responsibility for an attack which left four Israeli soldiers dead. The attack on a southern Israeli army post near the border with the Gaza Strip, yesterday, was “very serious and is a perfect illustration of the Palestinian Authority’s line of action,” Mr Sharon told Israeli television. There is no support for Pakistan’s request among the Security Council’s 15 members who stress that it is a bilateral issue and needs to be resolved between the two countries, council diplomats said. The immediate issue was the need for Pakistan to crack down on terrorist groups which had been operating in Kashmir and killing innocent people, they said, adding that fighting terrorism was the current priority. Pakistan’s Ambassador to the United Nations Shamshad Ahmed Khan had sought the UN Security Council’s intervention to ease the Indo-Pak tension during a meeting with the council President for the current month, Ambassador Jugdish Koonjal Dharmachand of Mauritius. Mr Dharmachand briefly mentioned about his meeting with Mr Khan during a closed-door meeting under “other matters” after the council had finished the day’s business. The council diplomats said there was no discussion as none of the members showed any interest. Mr Dharmachand mentioned the meeting as the President always briefs the council members about his meetings and if members show interest, there can be a discussion. With Washington wondering what happened to the three, Khalid Pashtoon, spokesman for Kandahar Governor Gul Agha Sherzai, said only one minister had surrendered and he was now in Pakistan. 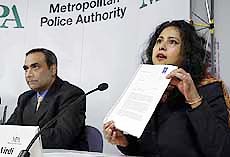 The other two were cases of mistaken identity. Asked about his earlier statement that the other two — former Defence Minister Mullah Obaidullah and former Mines and Industry Minister Mullah Saadudin had also given themselves up, he said: “I withdraw my statement.” They were a case of mistaken identity, he added. The interim administration said it understood that seven former Taliban officials, including Turabi, had surrendered to the local authorities and been released after they handed over their weapons and vehicles. Washington has twice called for the former ministers to be taken into custody so they could be interrogated about the Taliban and the Al Qaida network of Saudi-born militant Osama bin Laden. “We don’t have any sympathies for the Taliban,” Pashtoon said, adding the local authorities had been trying to disarm former Taliban leaders by offering an amnesty if they turn in their weapons. “We are trying to correct them in this way,” he said. But these deals, a traditional quid pro quo among feuding Afghans, fly in the face of US efforts to capture and question former Taliban officials for any clues to Bin Laden’s whereabouts or any possible Al Qaida plans for future guerrilla attacks. Pashtoon’s remark that Afghan agents could “fetch” Turabi from Pakistan also reflects the traditional way the Pashtun tribes split between Afghanistan and Pakistan disregard the Durand Line that Britain drew in 1893. WASHINGTON: The Pentagon will use unprecedented security measures, possibly sedation, as it begins Taliban and Al-Quida prisoners from Afghanistan to a naval prison at Gauntanamo Bay, Cuba, USA Today reported on Thursday. The prisoners will be chained to their seats and outnumbered roughly two to one by security guards as they are flown to Cuba aboard US Air Force cargo jets, each carrying 20 to 30 prisoners. They might also be sedated, the newspaper reported, quoting unnamed military sources. Prisoners will be manacled and possibly hooded during the trip, will not be able to leave their seats for any reason and will be chained to one another. The transfer of most of 368 prisoners was to take place over a period of weeks and all of them may not go to Cuba, the newspaper reported, quoting a military source. The U.S. military is holding 306 prisoners at a base in Kandahar, 38 at a facility in Bagram, 16 at Mazar-e-Sharif and eight aboard the Navy ship USS Bataan in the Arabian Sea. LONDON: The USA could soon be staging raids into Pakistan to track down Osama bin Laden and his key allies as the focus of the campaign against terrorism begins to move beyond Afghanistan, a senior US military official has said. The Pakistan Government had given the US troops permission to cross the border in the hunt for Al-Qaida terrorists and fleeing Taliban fighters, Gen Tommy Franks, commander of the military operation in Afghanistan, said. Intelligence reports confirm fears that Bin Laden may have escaped into Pakistan after the bombardment of his Tora Bora cave complex, a report in the Evening Standard said. When Afghanistan’s Interior Minister-designate Younous Qanooni came here on an official visit last week and held talks with Union Home Minister L.K. Advani, it was decided that New Delhi would soon be sending a “police team” to Kabul to help the interim government there. India would be helping the Karzai administration in the fields of police, intelligence and special operations, particularly anti-guerilla operations, well-placed sources here said today. The most important short-term strategic imperative before Afghanistan’s interim administration of Mr Hamid Karzai would be to tackle the feared guerilla raids, sources said. It is in this context that India’s vast and rich experience in anti-insurgency and anti-terrorism operations is sought after by the Karzai administration. The coming interim government is well aware of the covert threat looming large from its eastern borders — Pakistan — and knows that the ISI would not be taking its humiliation in Afghanistan lying low. Newcomer Alicia Keys, R and B trio Destiny’s Child and late singer Aaliyah each won two prizes during the ceremony yesterday at the Shrine Auditorium, as did country singer Tim McGraw. The tribute to Jackson was meant to provide a fitting climax to the three-hour ceremony. Instead it ended with a fizzle as Jackson took the stage to a standing ovation, thanked a long list of people, including actor Marlon Brando — “my other father” — and then split. Instead of performing, he had submitted a newly produced video clip of his 1988 song “Man in the Mirror,” but his representatives mysteriously asked event organisers to pull it at the last minute.